indicating your desired Region of Navigation, the Duration of your stay: 3 Nights, 4 Nights (Mini-week, Monday to Friday or Weekend), 7 Nights, ..., your Departure Date, Number of passengers as well as the presence on board of children or seniors, allowing you to benefit from additional discounts. 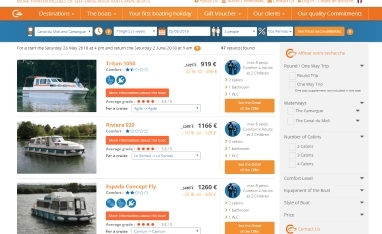 After a few seconds, the site will offer you a list of boats available with their fare (including any discounts). All you have to do is select the boat that suits you by clicking on "View the Offer Details" and a new page is displayed. If you have any questions about the cruise and / or the boat, click on "Request Information on this Cruise", otherwise click directly on "Book This Cruise". You will then have the opportunity to choose your options (to be paid and validate the day departure) and / or complements (to be paid for the reservation) and you will access the payment of the deposit by credit card (40% of the rental amount for a reservation made more than 6 weeks before departure, otherwise 100%).